MANCHESTER SHOW: European launch of Digifi's Digital Opera wireless earphones | What Hi-Fi? The S5 joins the existing Opera S2 model, and is fitted with an iPod adaptor, plus volume and track control buttons. 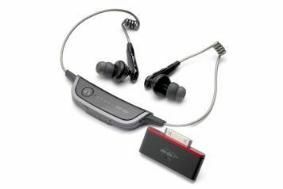 Using low power Kleer wireless audio technology, transmitting on the 2.4Ghz waveband, the S5 in-ear headphones have a range of up to 10m (32 feet) and a listening time of 10 hours. You can also share music with up to four friends from the same iPod, using four sets of S5 earbuds. The iPod adaptor supplied attaches to your iPod or iPhone, and can stream Apple Lossless music to the earphones. Digifi's S5 headphones, which weigh just 22g, are available now for £85 from the WireFreeHiFi website. And if you have an MP3 player with a 3.5mm input, rather than an iPod/iPhone, then the Digital Opera S2 earbuds come with a wireless adapter fitted with a 3.5mm jack. They costs £68.50. Kleer claims its wireless technology is more robust than Bluetooth, has a longer battery life and was designed to transmit lossless CD-quality stereo audio over a more robust wireless link. Join us at the Manchester Sound and Vision Show October 17th-18th. Full details in our special show blog.